An off the hoof decision meant we where heading out for Breakfast in the forest using a Frontier Stove yesterday. I had planned to head into the woods to do some foraging for fungi as it had been quite foggy and had been raining for two day anyway but when a friend contacted me we decided to head into the forest for a fry up. When we arrived at the location I had realised I had my frontier stove in the back of the car so we decided to carry that down into the birch and use that to cook breakfast off. As mentioned in a previous post I’ve had this stove made by Anevay for over 8 years and love cooking of it. The only downfall is its heavy to carry along way but sharing the load we dragged it into the forest. We ended up in a secluded area of birch and pine where we started to prepare for our breakfast. Firstly my friend needed to hang his Basha to dry so he set this up and I showed him some methods I use to hang a tarp. He realised the benefit of using a 3m x 3m tarp compared to a Basha. I have 2 tarps both made by DD Hammocks a super light and a normal both 3m x 3m. I really like using a tarp as there is so many different configurations you can use depending on environment and weather. Once setup and firewood collected I started a fire using birchbark, piece of flint and a steel striker. It take a little while to get this stove up to heat but after 15 minutes it was hot enough to place the pans and the eagle kettle on to start cooking and heating water for a brew. Using a skillet, frying pan and the camp kettle we cooked up breakfast and brewed some coffee. We sat eating and chilling listening to the deer rutting in the marsh behinds us for the middle of october it was still really warm as we where both sitting in t-shirts. I didn’t find many fungi just one lonely Bay Bolete but loads of Amantia Muscara around. Slight downfall was the welds on the stoves door had finally given way but after eight years of use I’m not complaining. On another note I have started uploading more weekly videos to my youtube channel so please take a look, comment, like and subscribe see what you think and let me know. Today was time to head out hiking the Birch Forest. The weather has been perfect recently for foraging for fungi so I headed out into the woods to see if I could spot any. As we started to walk into the birch forest i could see there where many slippery jacks but not fresh that morning. 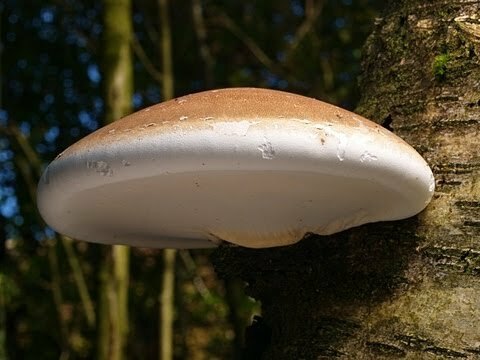 Birch Polypore (Piptoporus betulinus) is also called Razor Fungus and can be used as a strop to give a blade a Razor sharp edge. As well as giving your blade a super sharp edge it can also be turned in to a plaster. By slicing out a piece of the underside of the fungus and peeling it off you can make yourself a bushcraft plaster! Funny how nature works the same thing that keeps your knife sharp also keeps your blood in when you cut yourself!! I enjoy hiking the birch forest we had a look around but no fresh fungi so decided to stop and make some breakfast and coffee. I was using a small bush box for the fire and was using a flint, steel and birch bark to start my fire. Camera messed up so missed filming starting the the fire. The area I stopped for food was full of slippery jacks so I marked the area on my view ranger app for a time when conditions would be better for fungi. I had recently been playing and designing a foraging pouch which can be clipped onto a belt and is rolled up in a leather holder (below). First attempt was ok but I need to remove some of the clasps and turn them around so the bag could be removed from leather holder. Also so that the top of the leather holder could be clipped to inside of bag. I am lucky to have been shown a few safe mushrooms to pick by my wife. My wife is Polish and in Poland it is very normal to go out picking wild mushrooms and utilising them into diet. Mushrooms in Poland are normally either dried or pickled for storage. Now I only pick what I know and if I’m not 100% sure I leave them. I took a wander through an area I’ve seen a few cepps before and I was really surprised to find loads so I only picked what I needed.